The Baby Dan Configure System consists of flexible panel units that can be used in many ways. Configure / Flex L is perfect for keeping your child away from staircases or wide door openings, as a room divider or even ad a Hearth gate. 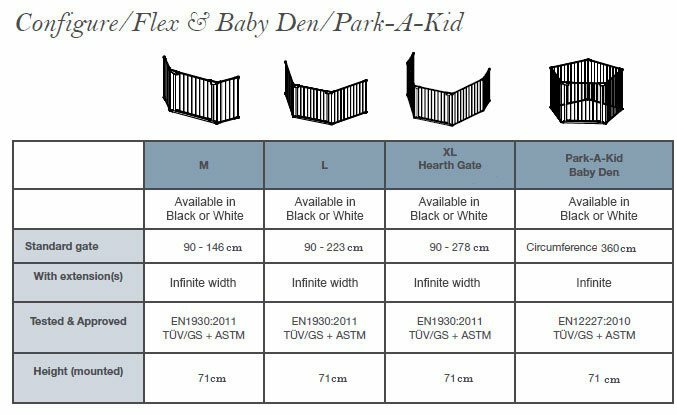 The gate is easy to mount and you can extend your gate with further section and position all sections as you wish. The extra wide door section provides easy access, and has a double locking handle for extra safety, which can easily be opened with one hand by an adult. Thanks to the quick release fittings, the gate can easily be dismounted from the wall fittings without the use of any tools. good quality fairly easy to put together does the job well. Love it!